Only 6 left! This item ships in 1-2 days. Proudly display your current rank with our Personalized Police Officer Business Card Holder. A handsome, personalized gift which presents a strong and knowledgeable display of your current business card. A great personalized gift for a new police officer or your favorite police department. 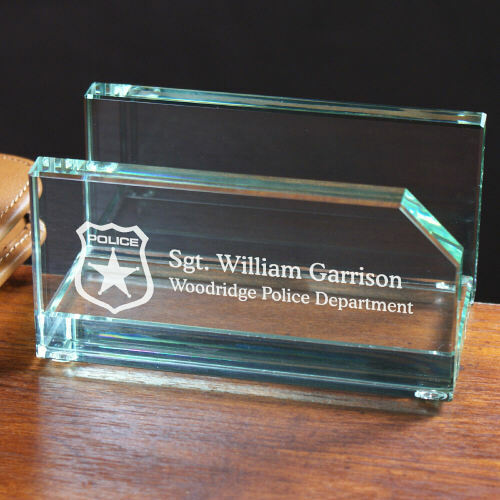 Your Engraved Police Department Business Card Holder measures 2" x 4" x 2 1/4". Includes FREE Personalization. Personalize your Business Card Holder with any two line custom message. There wasn't much of a description, so I wasn't sure how it would look. To my delight, it turned out to be really beautiful! Additional Details GiftsForYouNow.com is the leader in Personalized Occupational Gifts. Whether you are looking for a Personalized Gift for your Police Officer, Doctor, Attorney, Business Partner or Boss, GiftsForYouNow.com has what you are looking for at very affordable prices.